Tensions between republican prisoners and prison warders has reached levels not seen since the ‘dirty protest’ ended in November 2012. The prisoners are continuing to struggle against a regime which entails forced strip searches, controlled movement and isolation of republican prisoners. In the most serious incident recently, 21-year-old John Paul ‘JP’ Wootton was ordered by the administration to go “on the boards” as a result of a minor infraction two weeks before. The punishment of being put ‘on the boards’ involves being isolated for three days in a cell from which all furniture and bedding has been removed. The young Craigavon man, who is still awaiting a verdict in his appeal against a conviction on IRA charges in March 2012, refused to co-operate with the punishment. Other prisoners on the Roe 4 wing of Maghaberry then refused to leave the canteen or the yard until the matter was resolved. An attempt to mediate the dispute saw some negotiations entered into between the prisoners and the prison authorities. Not long into the process, however, a riot squad entered the wing and forcibly removed Mr Wootton. They brought him to punishment cell where he was stripped naked, forcibly searched and then put into isolation. 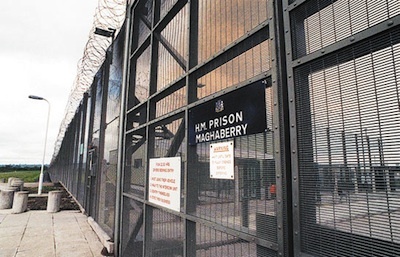 That incident has helped to create a renewed crisis at the prison, according to the Irish Republican Prisoners Welfare Association. “The Republican prisoners are furious at the treatment of JP and see this is as further confirmation that the administration have no interest in creating a conflict free environment on Roe,” the organisation said. The group is organising a white line picket in Belfast on Saturday to show solidarity and support for the prisoners. It is thought this week’s letter bomb incident may be linked to the escalating tensions. One explosive device, described as ‘viable’ by the PSNI, was intercepted in Lisburn en route to Maghaberry on Friday morning. Another was discovered in a Royal Mail centre in Derry on Thursday. The First and Deputy First Ministers have condemned those behind both devices. In a joint statement, Peter Robinson and Martin McGuinness said: “We utterly condemn the recent letter bombs discovered in postal sorting offices in Derry/Londonderry and Lisburn.